Download our ebook on Organic Gardening Basics here. If you like what you read or have learned at the Organic Gardener Podcast please subscribe to our mailing list for more news and information on how to make your garden grow and produce. Linda Kelso is owner of LK Landscape Design where she helps people make their landscapes more beautiful, enjoyable, and earth friendly! Today she’s here to share with us earth friendly designs you can implement in your yard! I’m a landscape designer, I live near Pittsburg, PA, I own my own business. This is my second year with LK Landscape Design. I specialize in using edibles as part of design and using sustainable or native plants. Landscape design is my second career. I have a bachelors in Psychology, I spent about ten years doing administrative and office management kind of work. Originally I started into gardening as a hobby and it just evolved into this new career for me. My parents always had a small garden, they would grow a few tomatoes or peppers when I was young. My first kind of moment when I connected with gardening was in the winter actually. My parents would receive seed catalogs in the mail, I loved to look at the pictures and imagine the garden I could create, and so, I remember one year I was probably 8-9 years old, and I got some of my dad’s very expensie, off limits to me, graph paper, I grabbed my crayons and colored pencils and I sat and designed my own vegetable garden. I remember doing that for a couple of years. I don’t think any of them made it into an actual garden, I don’t think my parents actually took those and made them into reality, probably because they were pretty elaborate. But that was my first connection to gardening. nature has to work hard to establishing normal again if it even can. Sometimes we use non-organic methods because they provide the short term easy solution but in a long term they actually cause more problems. So organic solves long term problems. I have had a lot of guests talk about the health of our soil. And I just went to this conference and that was an underlying theme to protect and care for the health of our soils. my parents always used a fairly organic approach. I grew up gardening without chemical control. the city itself really inspires me. The Phipps Conservatory in Pittsburgh has played a huge role in my new career. Pittsburg as a whole is there is a whole movement here for that. Pittsburg to me, I’ve been reading about Pittsburg for like 10-20 years, they are the one of the biggest innovators in the US. They have a huge medical technology and have a huge medical center there right? and I just read something about how they are embracing the green movement. So I am not surprised they are innovators. About 5 years ago I moved back here, and that’s when I transitioned into this new career. TED: Technology, Entertainment and Design is what Ted stands for, if you have never listened to a TED Talk definitely check one out! Even though I’m a landscape designer, my whole history with gardening was with vegetable gardening. So when I went bak to school for a degree in landscape design. I really wanted to integrate some of that with what I do. I discovered Rosalind Creasy. She does edible landscape design. She uses edible plants in her landscape designs. 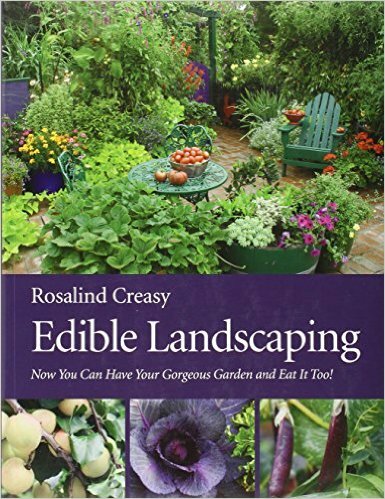 Her book is Edible Landscaping: Now You Can Have Your Gorgeous Garden and Eat it Too! I started down this non-tradtional when I read her book. I started to take classes at Phipps Conservatory in sustainable design. I read other books about it, I decided if I was gonna do this for a living, I wanted it to be about more then earning money, I wanted to do something good and contribute to the environment and help it. combinging ornamental landscaped. They can be vegetables, herbs, flowers. A lot of what she talks about, if you look a little bit into the permaculture movement, there’s this idea of plants doing double duty. Not just looking nice but having a purpose. not just about the tomato that you get, maybe letting things go to flower because some things produce really pretty flowers. Rosalind Creasy explains it better then I do, she has a lot of books on the topic and a nice website. Tell us about your landscape and what grew well this year. About my parents landscape! They did an experiment for me! They have about 2 and 1/2 acres of property. Whenever I design, I take into account the insects and other animals they support. So on my parents property part of it has always turn into this meadow area. So I asked my dad if he could stop moqing a part of that and I wanted to see if it would increase the number of bees and butterflies etc. Always lots of butterflies and bees back there When the other neighbors plants stopped blooming, there were always lots of butterflies, moths, and bees,and lots of birds back there but my dad was also happy because it was less mowing for him! That’s a pretty big piece of land isn’t it? So they must be out of the suburbs where they live? if you lived in a housing plan or a more suburban plan. One of your blog posts recently was about the law and design right? Do you want to talk about that at all? whenever you do anything on your property, you have to take into account, there are a lot of local ordinances, there are HOAs- homeowner associations. Sowhenever you design something you might think I want to build a deck, there are local ordinances. Sometimes when you hire a contractor, not always, but you have to read the contract carefully, if those ordinances are violated, you as the homeowner might be liable for that. As the homeowner you have to be aware, if you are building a deck or something make sure you are keeping within the law. Our first investment property was little house in Cut Bank and I was told that even painting the door, could need a permit and we had put up a fence and some trees and built a walkway etc. I want to use more permaculture techniques in my design. I’m just learning about permaculture now. I think it’s fascinating. It approaches gardening as a system, I kind of think about it that way anyway. Working with nature in your own backyard. There is a structure called an Herb Spiral are just really beautiful and would look really good in a landscape so my goal is to start using that in the future. I guess so… except upward. You can make it any size you want. I think anything less then maybe 4 feet at the base would be difficult. I had a client, I was designing one for, the largest part at the base was about 8 feet and each section got smaller and smaller. I never heard of permaculture till I started this podcast 8 months ago either. There was a student in one of my classes! He was like you gotta look it up! I was like I’m so busy. When I finally had time to look into it, I was like this is amazing. Kelly Ware has been in my most downloaded episodes. She’s talking about building a Permaculture Education Center down in Panama where she just moved. My number one most downloaded episode and I think she is downloaded a lot because she talks about being strategic. I’m so not like that, I’m always standing there with the plant thinking where am i gonna put this. So how do you start a design? I always start by interviewing the client then also walking around the property. What I’m looking for is problems they’re having. Maybe there’s a drainage area, or an area where things aren’t growing very well. or maybe they have nosy neighbors and want more privacy or maybe they have a vegetable garden but deer are an issue. So I always start with what the client wants, needs and what problems they are having in their yard. what does it look like but also what will it look like 10 years down the road… research and analysis before I ever pick the flowers or other plants out. they don’t see that behind that there is a lot of research and a lot of analysis that goes into that and a lot of expertise. It can make a big difference not just money but also frustration in the long run. Probably a big one is for trees. What kind of things do you think about for trees? In terms of the final size I don’t want to plant a 100 foot tall maple or oak tree right next to a house, if that tree ages, or gets damaged, it could damage house if it falls. Beyond that I also want to consider how can they help the home owner with their energy bills, can provide shade and if it loses it’s leaves it will let sun in the winter. And you can do that with shrubbery too. When chosing a tree, you have to think about safety, the mess that it might create, or can it be invasive or can it help with energy. Also the leaves would create compost and passive solar is so huge, people don’t always think about energy saving and where you windows are where your trees are can make a difference in your energy bill. that’s the sustainable house, it’s not like that at all. Like whoa what did they just do? That’s part of my business, I prune and weed and things like that. So a lot of people don’t understand the right time to prune. I don’t know if it’s like this where you live but in the past generation ir so there was a movement to prune things into geometric shapes. If you prune a plant like that continuously you can end up killing the plant, and it’s more susceptible to disease and pests, so when a lot of people hire me, I can reviatalize those plants and get them to grow in a way. So I get a lot of questions like why is pruning in the plant into a box killing it? I get some about controlling weeds without the use of herbicides and that sort of thing. Those are probably the most common. Russ Metge from Salt Lake City, he’s been my downloaded episode 26 talks about pruning trees. Dave Salman down in New Mexico talked about pruning flowering trees in episode 50 .
very little work, the plants were huge by the end of the season! If somebody wants to start incorporating edibles, herbs are a great way to start! I agree and they have that aromatherapy thing, and the bees love them. First they go to my chives which blooms in the spring and then they move on to my oregano and my sage. Does Rosemary grow flowers? I just got one at the Farmer’s Market this year. I just planted one this year as well, I really like the look of the leaves. It’s good mix up different textures. Rosemary has this completely different the leaves are just little needles and I like the contrast of that with other broad leaf plants and they smell good too! And the thing you want to do is grab a leaf and crush it in your hand to smell it. Something you would steer new gardeners away from that you find is typically challenging to grow. I have a coworker, she’s had a barbary thorn in her arm for years, they’re painful. Plus there’s been some research that they provide the sort of environment that ticks like to breed in and they are also invasive and birds eat the berries, so they get distributed anywhere birds grow so they can crowd out native plants…not my favorites, and I would not recommend it for landscape. Mulching in my own garden it’s not a big deal, it’s in a smaller space. it’s a stress fest for me! I’m not gonna lie! I’m always so paranoid, is the delivery guy gonna be able to find the place, and is he gonna be able to dump the mulch? I’ve never had a mulch job go wrong but it is a good work out and a big job, at the end of the day my body is tired! For clients usually a wood chip mulch. in my own garden sometimes leaves are what’s available around where live. We just got a chipper. That’s what I was gonna say, that we had 20 acres of Christmas Trees, and he would prune the trees, and the year he was gonna sell em, he would go around each spring pruning the trees. Back tot he mulch we’re excited to have more wood chips, and we’re excited to chop up the corn stalks and sunflowers and things we haven’t been able to compost before so we’er excited to create more mulch and things for our property. For me the tough one has always been finding soil, or manure for the beds. If they’re cows that ate weed-free food you don’t want it. Peggy Jane Ousley was a guest on the show in the beginning and we have a problem in our valley, they’re using that manure, and their stuff is not growing, almost getting burnt from using it. Our parents where they live is farmland, but I never thought to look into that before. I learned a ton since I started this podcast. I always thought our chickens were organic but I can’t afford to buy them organic chicken feed, and like I buy broccoli all year round and I can’t afford to buy organic broccoli so they eat that. But I don’t sell our eggs yet. I look at doing something is better then doing nothing. It’s like an evolution to do what you can do it at any time. Our chickens are now free. The rooster sleeps in a doug fir tree about 20 feet up and the chickens sleep on the fence now to be near him. Our neighbors got a rooster, which technically you’re not supposed to have in the city, but he would escape into our yard and we’d have to herd him. Our rooster marches our chickens around our fence line. What is your favorite activity to do? I really enjoy pruning and teaching people about pruning. It’s almost a lost skill and it is an art. When you do it well you create a beautiful plant and you create a healthier plant. It’s always a very peaceful type of thing and also an artistic thing. Are there any tips you would give listeners? Tell us about the best design or favorite project you worked on. Ill tell you about a project i got to do in class. You never had a budget so you could go all out. Match this colonial style house. I got to go crazy and have fun with it. I had a chicken coop, a whole raised bed garden section, a whole work area, if you look at early American designs or even some British landscape design from the past. You had, your landscape design had to suppor your life, you ha to be growing things that you could eat, you needed chickens. those older designs I like that, they integrate all of that. I love things that are beautiful but I like things that are practical too. When I talk to clients I’m always thinking about those practical things I can work into them that are also pretty and fun! From my dad! He would tell me don’t overwhelm yourself and start small… he would tell me that in terms of gardening and in life in general. When I was younger maybe not so young and I would like to try 20 new plants at a time, and try 20 new projects. My dad would always reign me in, try 2-3 new things and observe what the plants do so you can try them again next year and then try more new things. So what does your dad do? I have a friend starting a podcast called the Intuitive Business he might make a good guest on. My Felco Pruners. I love them. I use them on every maintenance job, they stay sharp for a long time, and stand up to a lot of abuse. A home gardener, a pair would last you a long long time. What I like too, they make a version, which is a little smaller, which makes it a lot more comfortable to do a lot of pruning work. Deluth Dry on the Fly pants… my work pants… I love them. Every maintenance job I’ve worked on , the material they are made of is stretch and strong. I worked for a garden maintenance company and I wore jeans, and my jeans just wore out after a couple of month and I have had these pants for 2 seasons now and they look perfect don’t have any stains or possible , because they are so lighweight I’m comfortable in them I can keep my legs covered. Safety …. Im always trying new recipes, I’m always experimenting, which probably drives people I cook for crazy because it never tastes the same. I don’ t have a favorite recipes but I have favorite flavors. I like Thai, Mexican, and Indian food. And a lot of those recipes you the things that I grow. Like tomatoes or peppers or lemon grass or cilantro. Grow those things in my garden so I have access to fresh ingredients for those recipes. Basically like a Thai Peanut Sauce a quick and dirty Thai Peanut Sauce. I take a can of coconut milk, add some peanut butter, and a sweet chili sauce, put a little bit of that in, I mix that up, warm it up, lemon grass… it gives this nice subtle lemony flavor.. it’s literally grass, you cut it at base, and peel off the outer layers, and when you get to the middle of grass stalk it tastes lemony. I let it boil for a while and it infuses that flavor, and it’s good on rice or noodles and I’ll put cilantro on top. Sometimes I get a really big craving! The Wrap and Roll in Whitefish has a Thai Peanut Wrap… mmmm! I like to look at different pictures, and get inspiration form that. I have a gazillion landscape design and boards… I’ll create a specific board for them…. I really like Garden Design Magazine, just a gorgeous publication. It’s targeted at designers, but there are no ads, I think a homeowner would get a lot out of it too. In the back part are sections for different areas of the country… design ideas for specific fro where you are. You know those coffee table books you could use it for that. Edible Landscaping: Now You Can Have Your Gorgeous Garden and Eat it Too! by Rosalind Creasy! I also love this book Bringing Nature Home by Doug Talamne, which is good about why using Native plants is important. Gaia’s Garden By Toby Hemenway about permaculture that has clear accessible resources. You can check out my page of books recommended on the Organic Gardener Podcast here. If you have a business to you have any advice for our listeners about how to get started in the industry? I would say if you are thinking about it, try to find a summer job with a garden maintenance or landscape design, important to learn the business sides of things and get some hands-on training, you’ll know if you’ll like it and if it’s something you want to turn into a career. Because designning and doing it for someone else for money is very different feeling then doing it for yourself. I would also say take some classes. You don’t need a degree it is important and the whys, behind why you prune at a certain time, or knowing how to identify certain plants. There was a book that was helpful to me. Its a really comprehensive guide. 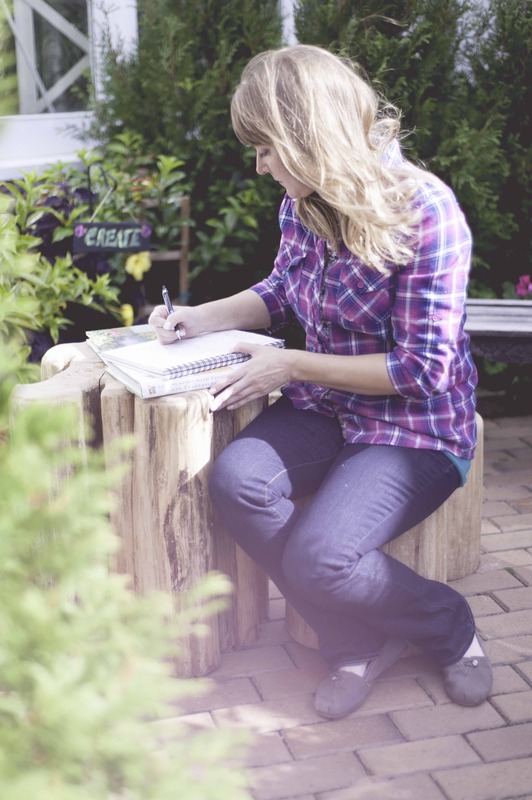 about all the things a landscape designer might do and how you might approach it. Any body who wants to do this business you need to do this book. Find other local business or communities online, people who can inspire and encourage you and keep you accountable. Nobody’s gonna understand the trials and tribulations of owning your own business. I just got an accountablitiy partner in my podcasting group and he’s probably been on my website more than anybody and given me great concrete advice to move it forward. So, I think there are so many pressing issues, out there, and sometimes it can be so overwhelming or discouraging to think about all of them but I always think we as individuals can do simple things in our own backyards to help solve or at least alleviate these problems. Movement to plant milkweed. see butterflies around it, I already have something for butterfly bush. Don’t lay eggs on it. They only lay their eggs on milkweed. The butterfly weed, doesn’t support whole life cycle of maonarch. A lot of that for simple steps and plant these certain plants, or you can stop using pesticides. So I’m a real fan of small steps in the right direction and educating people. Do u have an inspiration tip or quote to help motivate our listeners to reach into that dirt and start their own garden or earth friendly landscape? Attitude is imporatnt. not a succed or fail. Your onna make mistakes you can learn from them and keep trying. As my dad tole me Keep it simple and start small. Linda and I met through one of my all time favorite podcasters, Biz Women Rock Podcast! OGP is dedicated to encouraging gardeners and people who want to grow food and flowers to choose an organic approach and helping you create your very own organic oasis.